A perfect and simple dessert to WOW your visitors or to enjoy all to yourself!! Preheat oven to 160˚C/325˚F/Gas Mark 3. In a bowl, sieve together the flour, cocoa powder, baking soda and salt. In a separate bowl, beat together butter and sugar until light and fluffy. Add eggs and vanilla extract and beat until combined well. Stir in flour mixture to form a stiff dough then add in chocolate chips and stir until combined. Lightly flour a work surface and dust your hands too, then shape the dough into two slightly flattened logs on to the prepared baking trays, each approximately 12 inches long and 2 inches wide. Place in a preheated oven and bake for 30-35 minutes, or until slightly firm to the touch. Cool on baking sheet 5 minutes. Transfer to cutting board and cut diagonally into about 1-2cm slices. Arrange the biscotti, cut sides down, on baking sheet and return to the oven for about 10 minutes, or until crisp. Cool on a rack. 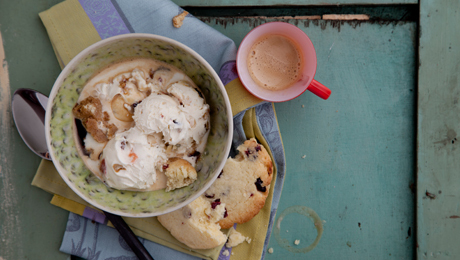 Serve the biscotti with some ice cream. We prefer strawberry or bubblegum ice cream from Gino’s Ice Cream or Christmas Pudding Ice Cream from Boulabán if you’re in the festive spirit.